Ambassadors to Vietnam will be invited to visit one of the world’s largest cave - Son Doong - in the central province of Quang Binh in May 2016. The tour is a cultural diplomatic activity co-held by the Foreign Ministry, the Vietnam National Commission for UNESCO and the provincial authorities. Son Doong cave, hidden in the UNESCO-recognised World Heritage Phong Nha-Ke Bang National Park, is more than 200m wide, 150m high, and approximately 9km long. 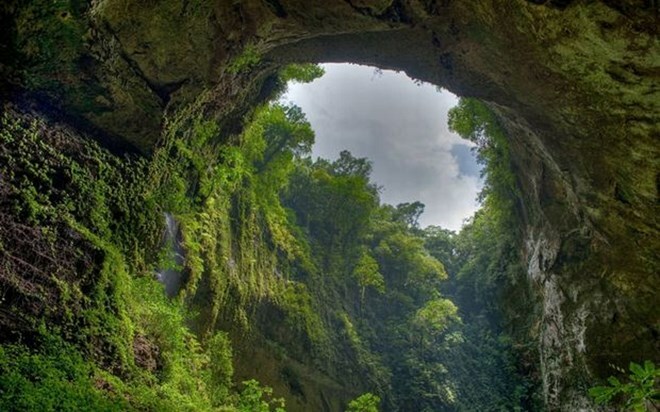 Within its caverns lie a jungle and a river, and the cave is large enough to fit a 40-storey skyscraper inside. The cave was classified as the largest cave in the world by the British Cave Research Association. The American news website Huffingtonpost.com declared the cave as an absolute must-see. Son Doong cave was also listed among the "52 Places to Go in 2014" by The New York Times Travel. The usual tour, operated by Oxalis Adventure Tours since early August, offers five-day and four-night service at the cost of 66 million VND (roughly 3,000 USD) per person during the January–August period. Each tour requires a team of more than 25 porters and cooks, a tour guide, two cave experts and two park rangers. This year, Son Doong welcomed over 500 visitors.